When Ben Strautmann turned 18, credit cards didn’t have a good reputation in his family. So, he was in no hurry to apply for a card of his own. 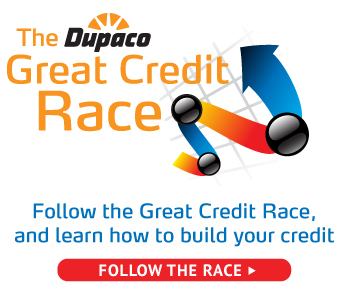 “I think it’s healthy to talk about the dangers of credit cards, but to just leave it there and only be afraid of them will leave you not understanding the benefits they can have,” says Strautmann, who is a credit coach for Dupaco’s Great Credit Race. Today, many young adults are avoiding credit. A 2016 Bankrate survey found that less than a third of Millennials have a credit card, while more than half of people age 30-49 own one and nearly 70 percent of people over 65 do, according to a CNNMoney story. When used responsibly, credit cards can be a tremendous credit-building tool. But here’s what every college student should know before applying for that first card. Dupaco can help. During a free, one-on-one Credit History Lesson, you can learn the ins and outs of credit—and how to start sending your score in the right direction. The length of your credit history makes up 15 percent of your score. The older it is, the better. Steer clear of the never-ending credit card offers you’ll undoubtedly receive, cautions Great Credit Race coach Amanda Durham. Keep it simple. The Great Credit Race participants who have used their cards for small purchases and paid off their balances immediately have been the most successful at building their scores as high as possible during the six-month competition. Even small balances are helping you get in the habit of managing bills within your budget. When you build your credit, you also should monitor it. With Dupaco’s free Bright Track credit monitoring service, you can review your credit report and score any time—and keep an eye out for fraud.